The Yiddish writer David Ignatoff was born Dovid Ignatovsky on October 15, 1885 in Brusilov, a shtetl not too far from the provincial capital of Kiev. Like most young men of his generation, he received a traditional religious education and then rejected religion for the ideals of revolution. He moved to Kiev where he became active in the Iskra group of Social Democrats. Born not far from Kiev in 1885, Dovid Ignatovsky came to America in 1906 and joined the group of writers who called themselves Di yunge (The Young Ones), who turned the Yiddish literary world upside-down. Ignatoff brought a style to the American literary scene, here's the cover image from his novel 1918 novel In Kesel-grub (In the Crucible). 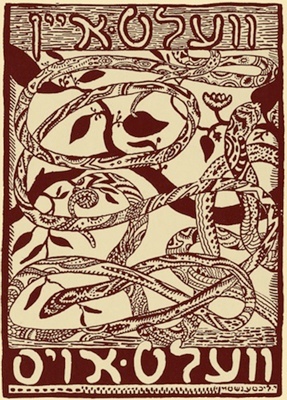 Nearly all of Ignatoff's works appeared in dazzlingly illustrated books and anthologies, such as Velt Ayn, Velt Oys (From One World to the Next) shown here, which Ignatoff edited in 1916. Vundermayses fun altn prog (Wonder Tales of Old Prague) published in 1920 and illustrated by Benjamin Kopman. He immigrated to the United States in 1906 and made his New York literary debut in 1907. 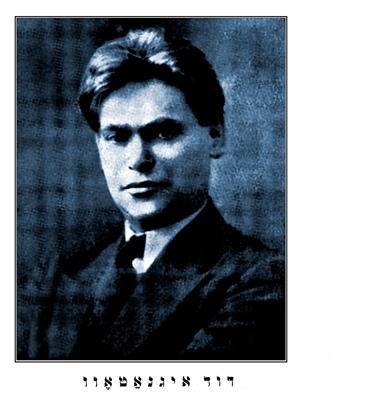 In 1912 he founded the avant-garde Yiddish journal, שריפֿטן (Writing) and was a leader of the group of writers called די יונגע (di yunge, or the Young Ones). In addition to a major shift in literary style, di yunge brought a bold, modern visual aesthetic to Yiddish literature, reflected in their dazzlingly designed books and journals. Ignatoff introduced a contemporary Russian Symbolist influence into the American Yiddish literary scene as well as a new urban sensibility, while still addressing the classic themes of American immigrant literature. 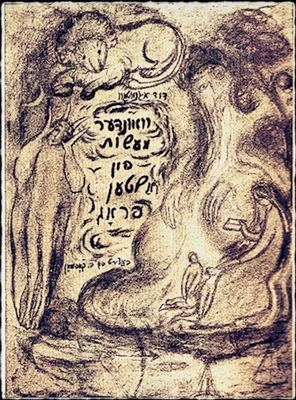 His popular 1918 novel אין קעסעלגרוב (In the Crucible) depicted a group of immigrants and their quest for ideal love. 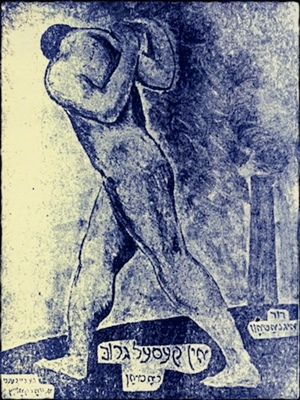 Ignatoff also masterfully fused a romantic idealization of Jewish tradition and his radical symbolism, as shown in his וואונדער–מעשׂות פֿון אַלטן פּראָג (Wonder Tales of Old Prague) published in 1920. Ignatoff died February 26, 1954 in New York.